The city of St. Petersburg was established in 1703 when Russia regained control of the land after a war with Sweden. Peter the Great ordered the building of the Peter and Paul Fortress on the estuary of the river Neva to guarantee Russian access to the Baltic Sea. Today, St. Petersburg is a thriving metropolis with state-of-the-art traffic signals, well-marked roads and a good public transportation system. 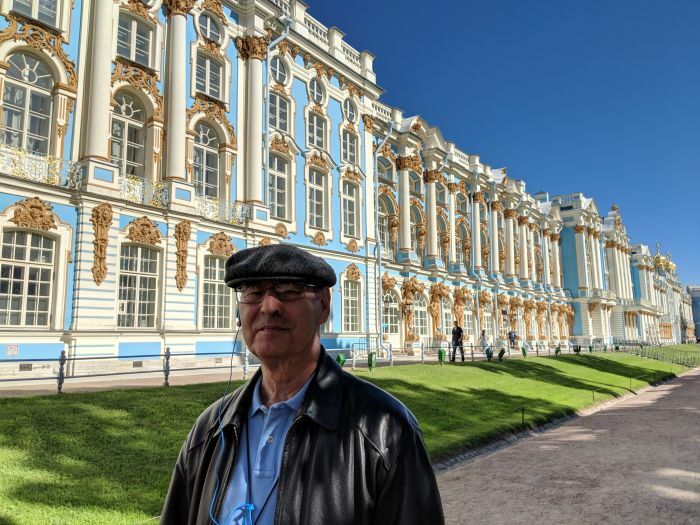 The government has spent a lot of money and effort restoring historical sites to the former opulence of imperial Russia in the 19th century. 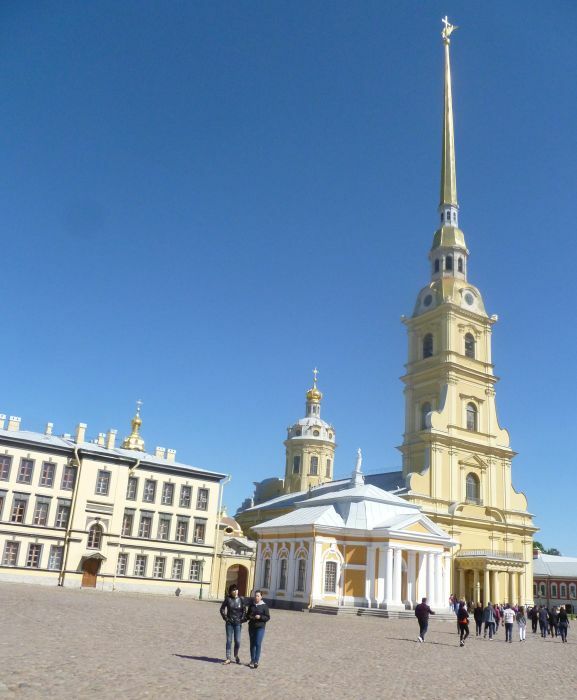 The cathedral in the Peter and Paul Fortress is where the Romanovs are buried. The Romanov family was the second dynasty to rule Russia. In 1917 the Romanov dynasty had 65 members, 18 of whom were killed by the Bolsheviks, including Czar Nicholas II and his family. The cathedral only has a marker but no graves for Nicholas, his wife, and his children. 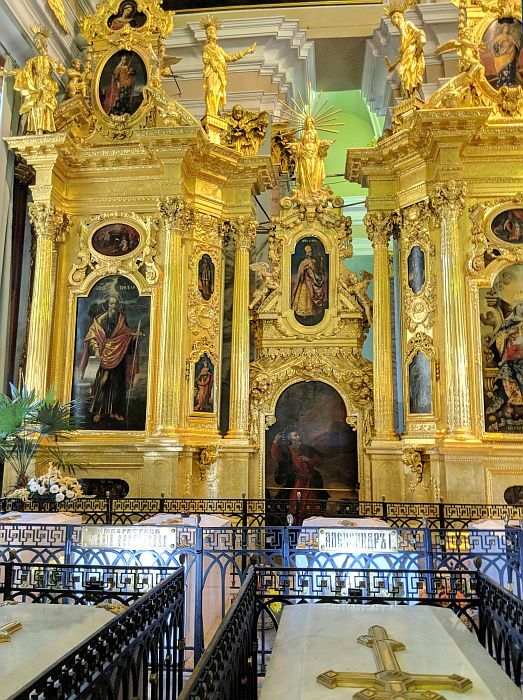 The cathedral in the fortress is ornately decorated with gold leaf, which provides a suitable royal background for the tombs of the deceased Romanovs. 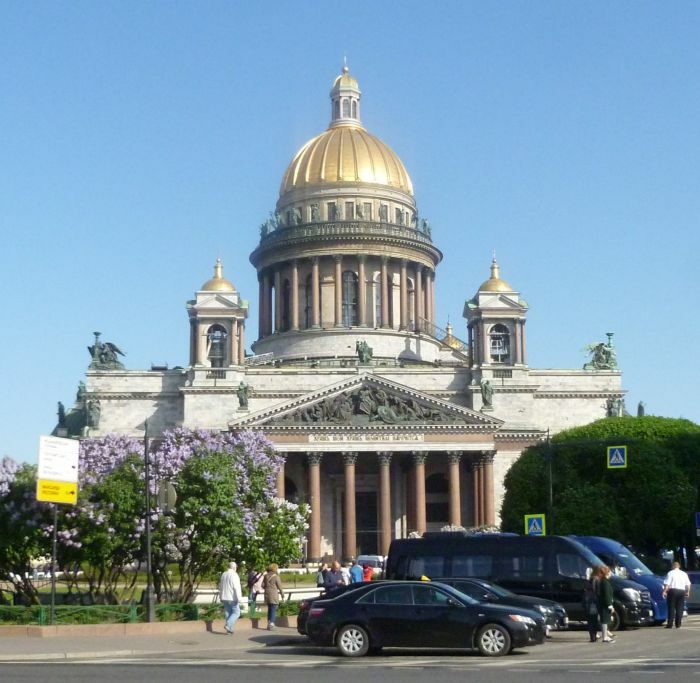 St. Isaac's Cathedral is the largest Russian Orthodox cathedral in St. Petersburg. The cathedral took 40 years to construct and it was finished in 1858. Under the Soviet government, the cathedral was turned into the Museum of the History of Religion and Atheism. After the fall of communism, regular worship activity resumed, but only in a side chapel. A large grassy field that was in front of the cathedral is now a busy thoroughfare and parking lot. 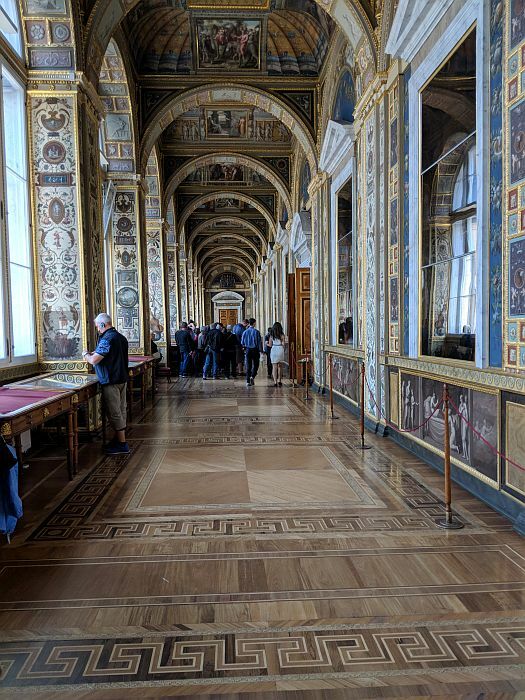 The Hermitage Museum displays works of art and culture. It is one of the largest museums in the world. 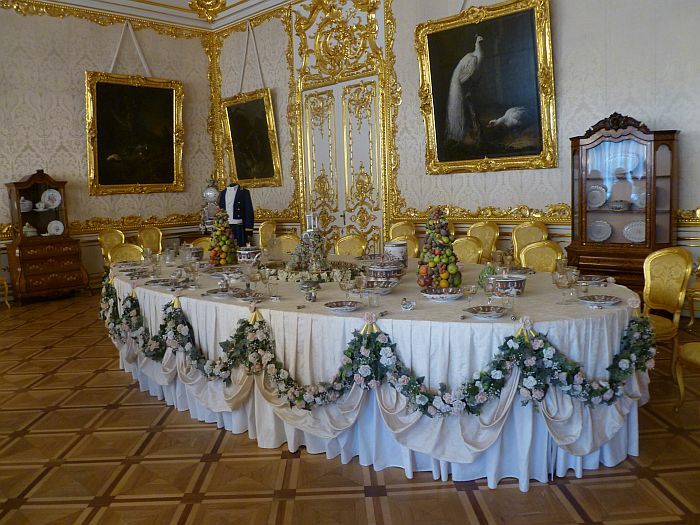 It was founded in 1764 by Empress Catherine the Great and it has been open to the public since 1852. 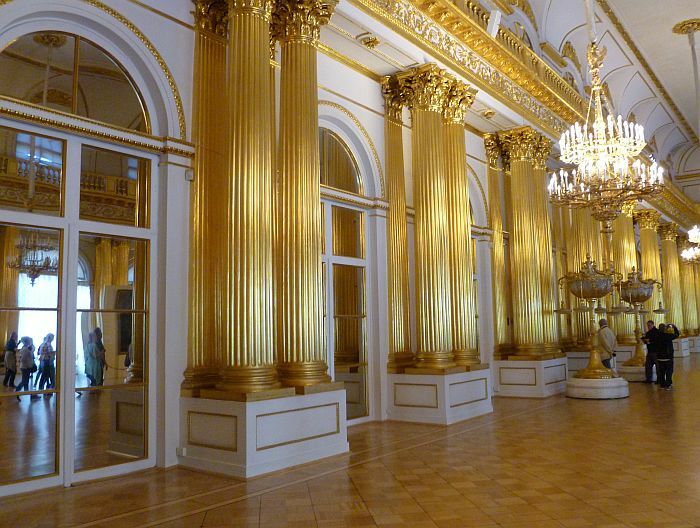 The Hermitage Museum was originally the Winter Palace for Russian monarchs from 1732 to 1917. Visitors to the museum are asked to wear shoe covers to reduce wear on the beautiful wooden floors with intricate inlay patterns. Everything is opulent and magnificent from the floor to the ceiling. The huge rooms could be used for large parties and ceremonies. 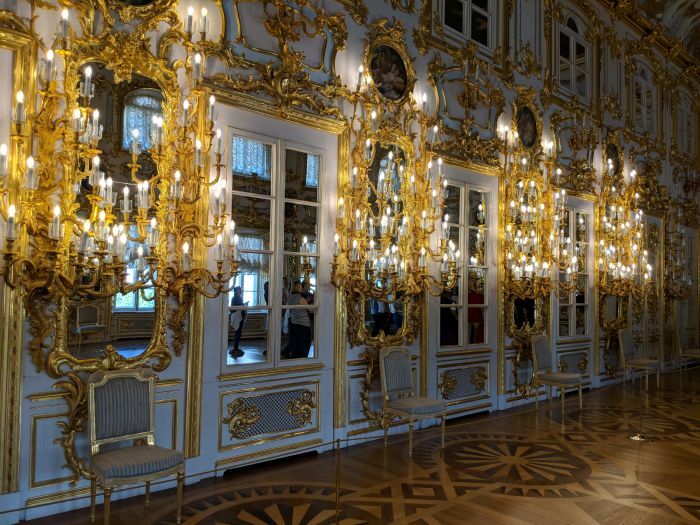 The gilded pillars and elaborate chandeliers could make any king feel at home. The Hermitage displays excellent paintings and sculptures. 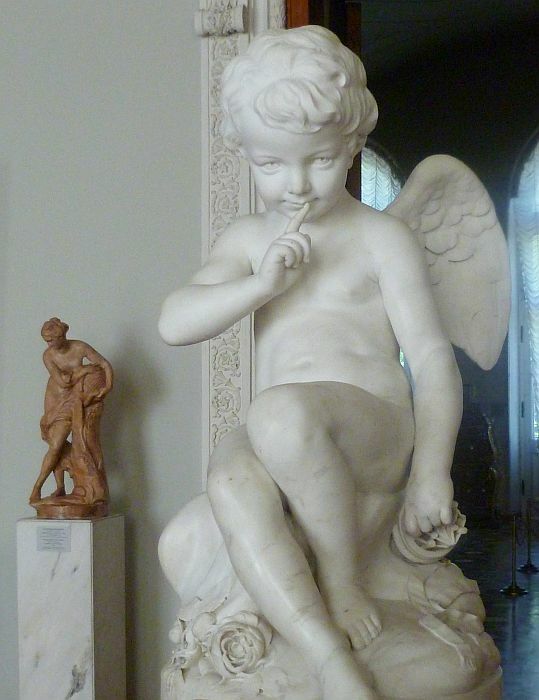 This marble sculpture of a cupid is masterfully carved. The child-like features are very realistic, including the smile, the gesture in the eyes and the delicate hands. 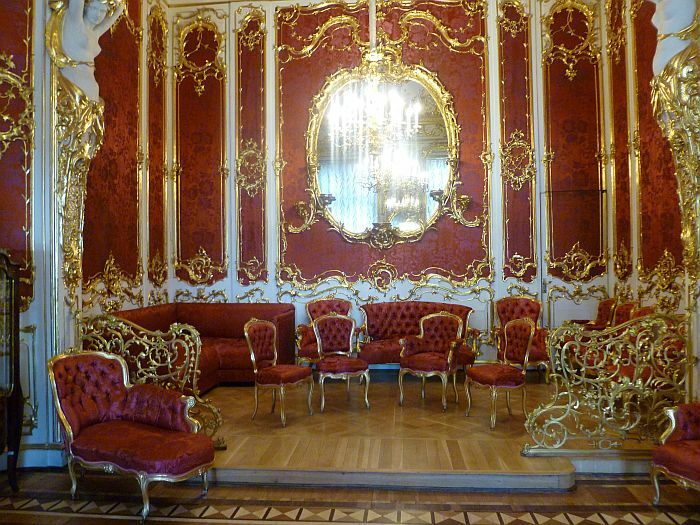 The red room has wallpaper with the same pattern as the furniture upholstery. Everything is trimmed in gold. This is the perfect place to lounge around with some intimate friends to discuss the latest fashions and exchange some gossip. Peter the Great ordered the construction of the Peterhof Palace, which would be better than the Palace of Versailles used by the French kings. The palace and its gardens were ruined by the German forces during World War II. Extensive reconstruction has restored this palace to its former beauty. Even the gardens, which require constant care, are kept well trimmed. This is a popular tourist attraction. The Peterhof Palace is painted sky-blue with white trimmed windows. Gilded cornices and statues provide contrasting ornamentation against the white trim. Elaborate chandeliers along the wall and wooden floors with geometrical inlays provide the perfect atmosphere for a royal ball. This dining room has the finest china, gilded chairs and a table decorated with flower garlands. The paintings on the wall, the geometric design of the wooden floors and gold-trimmed doors provide a cozy atmosphere for a breakfast of blintzes with caviar topped with sour cream. 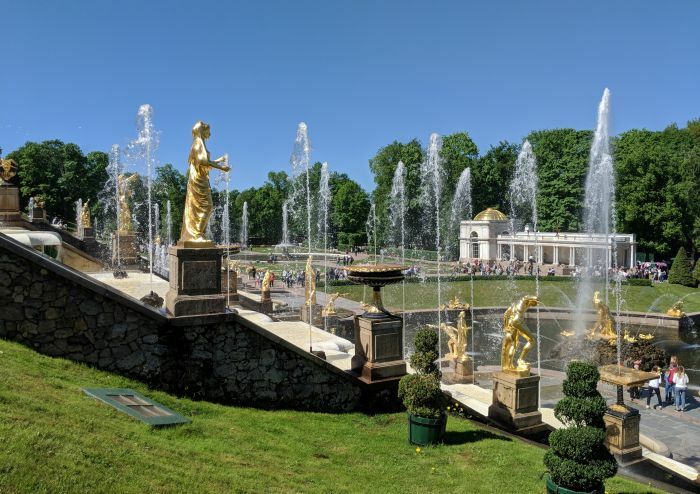 The garden of the Peterhof palace is one of its major attractions. Gold statues line stairways to a forum suitable for theatric productions. The fountain spouts are produced by a carefully engineered pipe system that does not use pumps. The garden is large and has a lake and a reflecting pool. 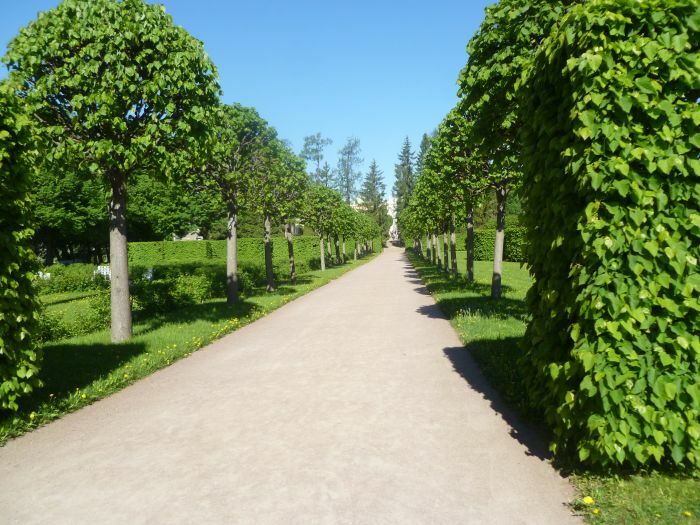 The paths are lined with flowering plants and trees that have been trimmed very precisely. A large labor force is necessary to do the gardening. 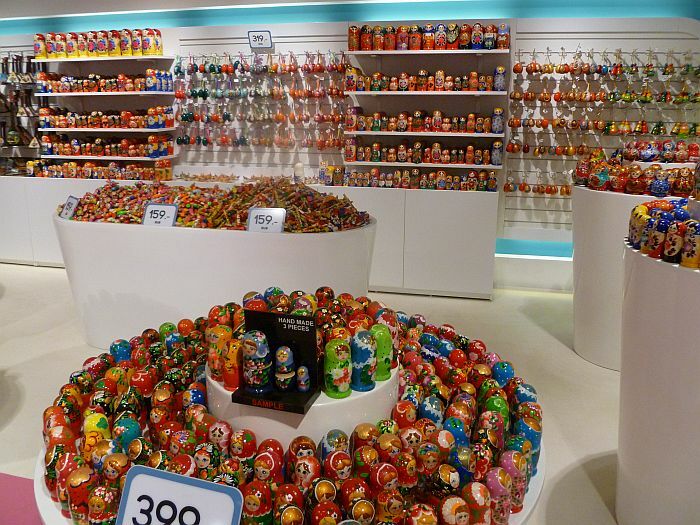 The gift shops of St. Petersburg offer many types of souvenirs, including the famous matryoshka nesting dolls. 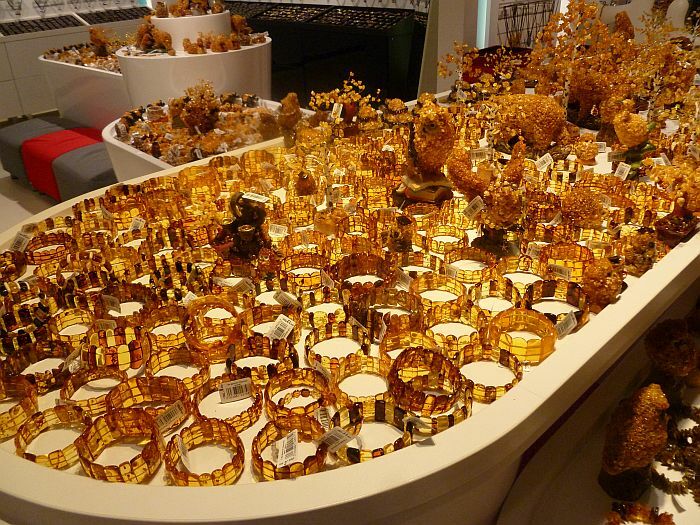 Amber is a fossilized resin of coniferous trees that grew in Europe about 70 million years ago. Amber floats in seawater, and storms wash it frequently unto the shores of the Baltic Sea. Amber sometimes contains trapped insects.